VSCO is a photography application that is widely used by iPhone users. It allows users to take photos and share the edited photos with other VSCO users. But, the photos taken through the VSCO app might accidentally get deleted before you can export it to the Camera Roll of your iPhone. You might lose the photos if you have recently formatted your device or you have lost or got your iPhone replaced. In this case, you may need to know how to recover deleted photos from VSCO. Tip: How to Save Pictures on VSCO? After you save the VSCO photos to the Photos app of your device, there are chances that photos might get deleted from the device. In this case, you can recover deleted VSCO photos with the help of an advanced data recovery tool. iMyFone D-Back is sophisticated software that helps in recovering the lost photos of your iPhone even if you have not created a backup. It has been recommended by CNET, techradar, PCWorld, 9TO5Mac and other professional websites. 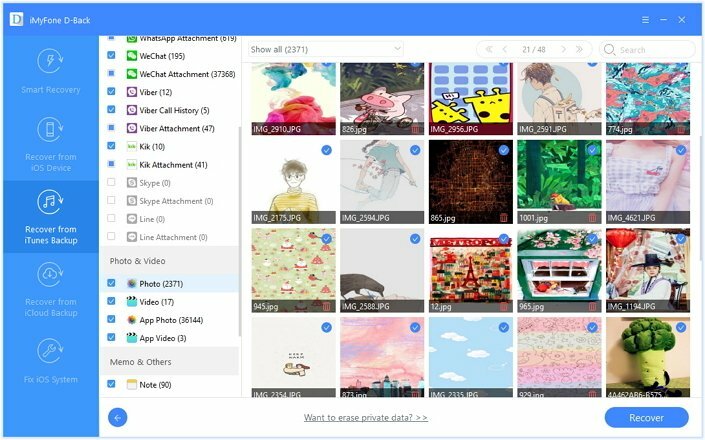 D-Back applies advanced technology to search for the deleted photos in the SQLite database in the most thorough way, which makes it the best photos recovery tool with the highest recovery rate in the market. 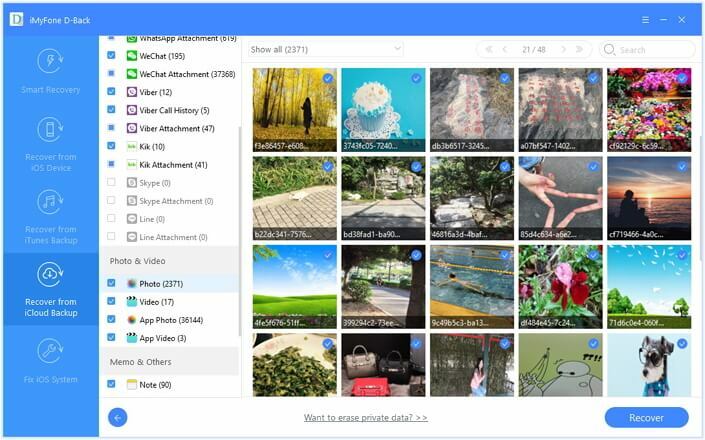 It supports to recover deleted photos without backup. 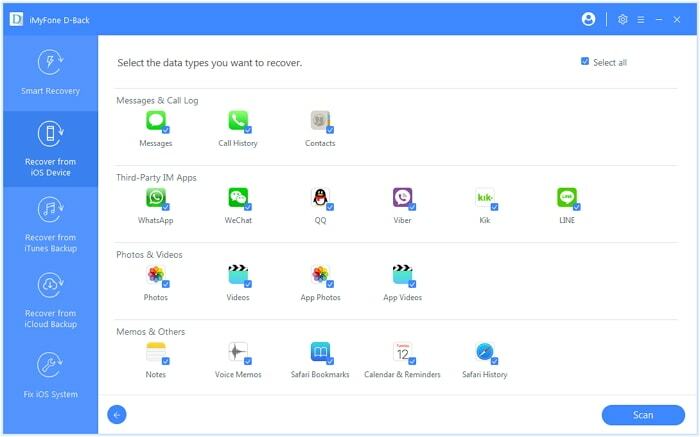 It supports other 18 file types from iPhone such as contacts, messages, voice memo, WhatsApp and etc. It is compatible with all iOS devices and iOS versions. Step 1. Open iMyFone D-Back software and click on “Recover from iOS Device”. Click “Start”. Connect the iPhone to your computer. When your device gets detected by the program, click “Next”. Step 2. Select “Photo” and “App Photo” under “Photo &Video” and click “Scan”. Step 3. When the scanning gets over, all the photos including VSCO photos of your iPhone will be shown. Select which photos you want to recover and then click “Recover”. You will be asked to choose a folder for saving the recovered VSCO photos. The above method is used if you have not created a backup of your device’s data. You can also recover deleted VSCO photos from iTunes backup if you have. Keep in mind that all current data will be replaced with restored backup. Apple allows you to restore the entire iTunes backup including the deleted VSCO photos to your device in just a few steps. Step 1. Open iTunes on your computer and connect the iPhone to it using the USB cable. Step 2. Complete all the steps that appear on your computer screen and then select your iPhone. Step 3. Choose Restore Backup and select the latest and appropriate backup of your device after checking date and time. Step 4. When you click “Restore”, the recovery will begin. The entire data including deleted VSCO photos will get restored. You can also use third-party software to selectively recover VSCO photos from iTunes backup without restoring the entire backup. Step 1. Open iMyFone D-Back software and click on “Recover from iTunes Backup”. Click “Start”. All iTunes backup will be displayed on the screen. Choose the most relevant one and click “Next”. Step 3. When the scanning gets over, all the photos including VSCO photos of your iPhone will be shown. Select which photos you want to recover and then click “Recover”. All the selected photos will be recovered and saved after you choose the folder. When you recover the lost VSCO photos by restoring the official iTunes backup, the entire backup will get restored. With this, you might lose the previously saved data of your device. But, when you recover deleted VSCO photos using iMyFone D-Back, you don’t have to restore the entire backup. You can select only the deleted VSCO photos and recover them in a few steps. If you back up data continuously to iCloud, you can recover the deleted VSCO photos using iCloud. You can restore the official iCloud backup to your iPhone and retrieve the lost VSCO photos. Please note that you need erase all content and settings first. Step 1. Go to Settings -> Apps and Data screen and tap “Restore from iCloud backup”. Step 2. Sign in with your Apple ID and password. Step 3. 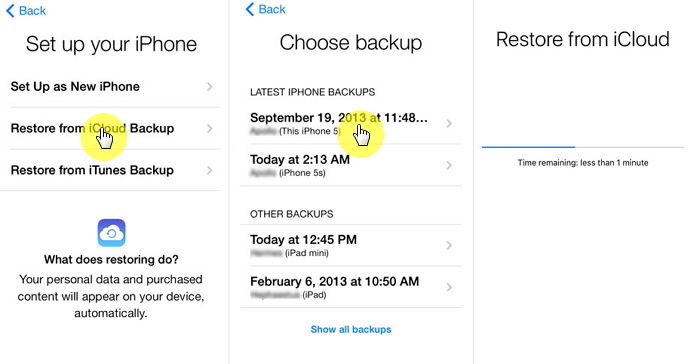 Select the most appropriate iCloud backup after checking its date and time. The data transfer will begin immediately. Step 4. If asked, enter your Apple ID and password again for restoring the apps and purchases. Step 5. Once the recovery process gets over, the entire iCloud data will be restored to your iPhone. If you don’t want to restore the entire iCloud backup, you can use third-party software. Step 1. Open iMyFone D-Back software and click on “Recover from iCloud Backup”. Click “Start”. Then sign in your account with the related information. Step 2. All iCloud backups will be displayed on the screen. Choose the most relevant one and click “Next”. Step 3. Select “Photo” and “App Photo” under “Photo &Video” and click “Scan”. Step 4. When the scanning gets over, all the photos including VSCO photos of your iPhone will be shown. Select which photos you want to recover and then click “Recover”. You will be asked to choose a folder for saving the recovered VSCO photos. When you restore the official iCloud backup, the entire data of your iPhone will get replaced with the restored backup. But when you use iMyFone D-Back for recovering the lost VSCO photos, you don’t have to restore the entire iCloud backup. You have an option to select the individual photos from the software itself and then recover them in simple steps. If you are thinking how to recover deleted photos from VSCO, you can rely on third-party software. This is because iPhone data is saved in the database called SQLite. When you delete VSCO photos from your device, it changes from “Allocated” to “Unallocated” state, leaving the actual data in the database. When you create new data in your device, the data in the “Unallocated” space will get deleted first and get replaced with the new data. The third-party data recovery software can easily access the iOS SQLite database for retrieving the deleted VSCO photos, which official way cannot make it for you. This is the reason many official websites and users trust this data recovery software to recover lost data. You can easily back up the pictures that have been imported into the VSCO app. For iCloud backup- enabled devices, the pictures will get saved daily whenever the device gets connected to a Wi-Fi network. Follow the steps to enable the iCloud backup. 1. Open Settings on your iPhone and tap on your Apple ID. 2. Tap on iCloud under your ID. 3. In the next screen, tap on “iCloud Backup” and toggle it On. 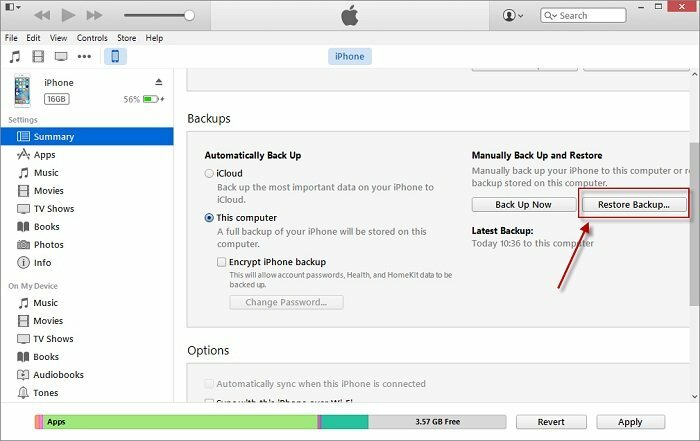 Follow the steps below for creating the backup of the device’s data using iTunes. It should be done regularly so that you can recover the photos in case you lose or delete the VSCO photos. 1. Open iTunes on your computer and connect your device to it. 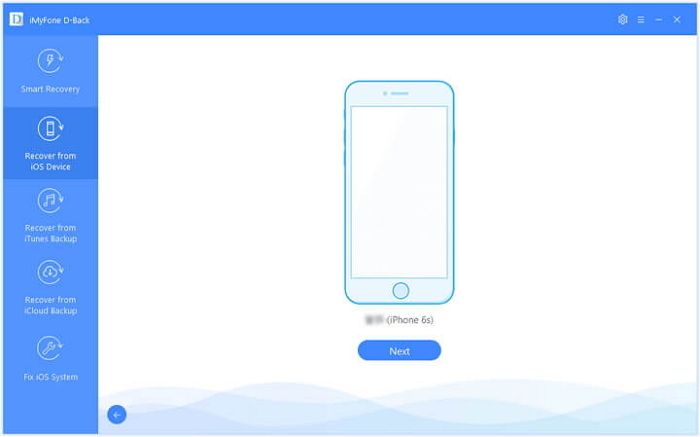 Select your iPhone. 2. Click on “Summary” on the left. Under Backups, select “This computer” and tap “Back Up Now”. If you lose VSCO photos and search methods to recover deleted VSCO photos iPhone, you should view all the above methods. You can check the reviews carefully and then select one you trust. If you have any problems, let us know in the comment section below. iPad Stuck on Connect to iTunes Icon? Here is the Fix!